Solar, Wind, Biological, Geothermal, these are all ways the world may generate its power needs in the future. Your students can explore and experiment with these kits. Show them how the future will be illuminated. Explore wind energy in this inventive vertical turbine design. 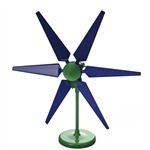 Its simple format allows you to create free, renewable energy with a spin or by holding it to the wind, yet its incorporation of technology allows for limitless customization and green energy research. Runs off a fan or even a simple hair dryer! The Sky-Z Hydro is the newest member of our Turbine family. With powerful curriculum components that focus on Energy and 3D Printing our kits stand alone in the Education and Maker industries. Expanding on our hugely popular Sky-Z Turbine, the Sky-Z Hydro uses the best elements of our existing Limitless platform in terms of variables, coupled with advanced hydro-electric power generation principles to create a highly versatile and exciting kit. The Sky-Z Hydro platform has over 20 possible wind/solar labs that can be tested. All of our Energy kits come in either AC (Alternating Current) or DC (Direct Current) configurations, the difference being in the type of electricity generator that the turbine will use. All kits come with a 6 Paddle hub that allows users to use anywhere from 1-6 Paddles in their design. DC kits can be used across all grade levels elementary and above. The custom designed paddles provided. Your own 3D printed paddles that can connect to the provided stem adaptor. We will provide the necessary .STL files for you to print free of charge (here (LINK)). The stem adaptor and all of our paddles are designed to connect using a .25” in (6.35mm) dowel. This dowel can be used to connect DIY paddle designs to the hub. NOTE: This product has a flat shipping rate of $12 per piece. Bulk rates and bulk discounts may apply. Please contact us for details. Explore wind energy in this inventive vertical turbine design. Its simple format allows you to create free, renewable energy with a spin or by holding it to the wind, yet its incorporation of technology allows for limitless customization and green energy research. 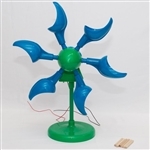 AC kits are recommended for advanced middle school users and above due to the higher degree of difficulty involved with building an electricity producing generator. 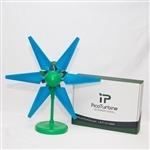 The most complete Educational Wind Turbine on the Market. 3 different size blades, pitch built into the Hub, completely hands on, the ability to customize your DIY generator using pre-wound coils & rare earth magnets, convert AC to DC power with the DIY rectification system. Make your own blades and test them out. 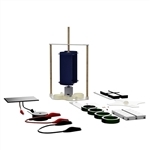 Great for Physics, Environmental Science, and Alternative Technology classes as a hands on lab.